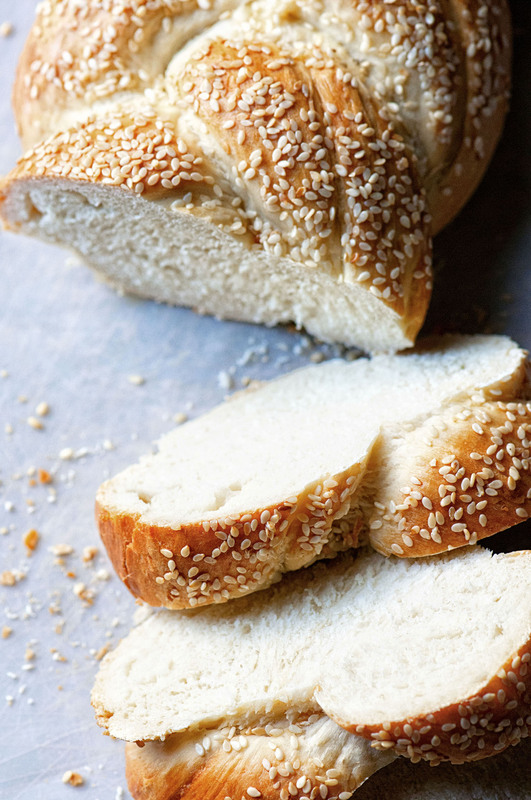 This Braided Italian Bread is made with a Biga starter. It’s braided and has a sesame seed encrusted outside and soft inside. Mix together the ingredients in a medium bowl. Cover with plastic wrap and let it sit overnight. It’s best to set it in the warmest area of your home. It’s not going to rise much but you should see bubbling and definitely smell the yeast. Using a stand mixer with the dough hook attached, add starter and the remainder of the dough ingredients. Knead the dough until a soft, smooth dough forms. All of this can be kneaded by hand if desired. Transfer dough to a large, lightly greased bowl and cover with plastic wrap. Let rise for 45 minutes. Remove the plastic wrap and punch down the dough. Place the plastic wrap back on and let rise for another 45-60 minutes. Transfer dough to a lightly greased kitchen island or counter. Divide the dough into three equal pieces. Roll each piece of dough into a 16 inch rope. Braid the ropes, tucking both ends under, and place on a greased baking sheet. Cover with more plastic wrap or a kitchen towel and let rise for another 90 minutes. For the topping: Whisk the egg and water together and brush onto the braided dough. Sprinkle with sesame seeds…go heavy handed on that, you want a lot of them on there. Bake the bread for 25-35 minutes. If you want a softer outside go for the shorter time. If you want a more crunchy bread go for the longer. The internal temperature should be 190°F. Remove the bread from the oven and let cool on a rack. Serve with butter or whatever you like! Recipe created by Sweet Recipeas. My first loaf of bread ever! Just made this with a whole wheat flour. Had to tweak the recipe to work with the courser flour but it worked great. Very simple from start to finish.